Place an oven rack in the lower-middle position and heat the oven to 250 degrees. Line a large rimmed rectangular baking sheet with parchment paper and set aside. Place the oats, almonds, cashews, coconut, seeds and spices in a large mixing bowl and toss to combine. Heat the butter and honey together in a small saucepan over low heat until the butter melts. Stir in sea salt and vanilla. Remove from the heat. Pour the hot liquids over the dry ingredients and stir with a wooden spoon or rubber spatula until the dry ingredients are evenly moist. 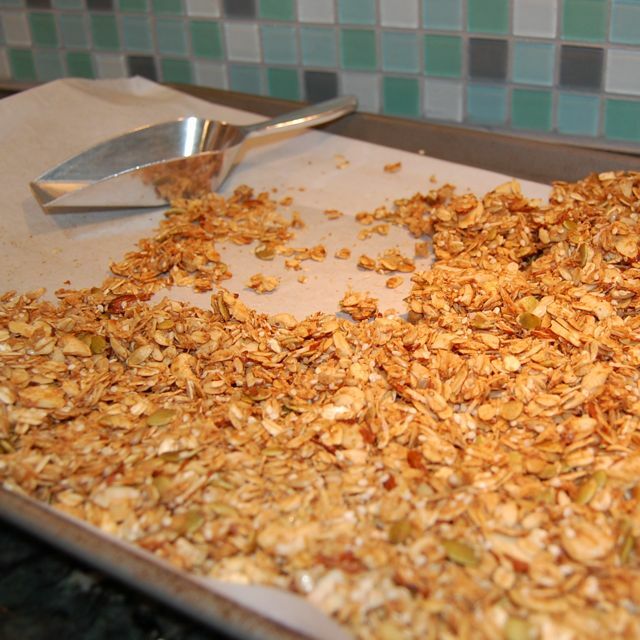 Turn the granola onto the prepared pan and press firmly with a spatula to create an even layer, about 1/2 inch thick. Bake until the granola is firm to the touch and a deep golden brown, about 1 hour and 15 minutes. (The granola will become crisper as it cools.) Cool completely in the pan, then lift an edge of parchment and break the granola into pieces (if making bars) or break it up into small chunks by pounding it in a zip lock bag (if making cereal). Store in plastic bags or air tight container at room temperature. The granola will keep at the height of its texture and flavor for 2 weeks. Serve with dried or fresh fruit and milk or yogurt, or eat out of hand. I made the bars and the cereal, and both turned out delicious! Thank you for the recipe! I love getting recipe reviews on here…thank you for taking the time to write something! I made this granola last night and it is better than anything I have ever bought. Thanks for the great recipe and for opening my eyes to real food. I am about to make a lot of changes in our household – thanks for the information and inspiration! I’m planning on hitting Earthfare in the next couple of days for the coconut, do they have them there? I usually eat “Bear Naked” granola, but love the idea of making my own! Thanks for your comment! I love to know that all of this blog posting is making a difference for at least some people 🙂 Also, you will find that you will probably eat less of the Great Harvest bread because it is more filling than grocery store bread so it might be a better value than you think. Also, I get sesame seeds from the bulk bins at Earthfare. I actually get just about all of my granola ingredients from Earthfare including the unsweetened coconut (in the baking aisle – green bag). I am definitely a bigger fan of Earthfare than Trader Joes when it comes to eating real/organic food (especially produce). Good luck! Found everything, and made it last night. It’s absolutely delicious!! Next weekend, I’m going to try making the bars! OMG! I just made this and it was absolutely delicious. I couldn’t find unsweetened coconut, so I skipped it but it didn’t matter. It was probably better that way since Jason doesn’t care for it. I only made half a batch, and now I wish I had made more because it will be gone in no time. Thanks for such a wonderful recipe! This granola is amazing! I made it last week and everyone gobbled it up. Great blog! Having food allergies and sensitivities I’ve been reading labels for awhile now. I’m so glad to see that other people are on board with real food! Have you tried adding dried fruit to the granola? I think I would add it at the mixing stage before popping in the oven? I also have been reading your 100 Days for Real food blog and was sympathizing with the boy that has celiac. I have a great (and easy!) recipe for tortillas if his mom would like the recipe. But, I’m not positive it contains 100% whole grains. Cheers! Whoops! Didn’t read your blog carefully enough, I see the part about the dried fruit! I would love your corn tortilla recipe…I’ve been wanting to give those another shot! I just used raw steel cut oats…and you are right they are not flaky, but instead like hard little bits. I don’t cook the rolled oats first either. Just pour them in and bake!